RA MES State Fire and Technical Safety Inspection employees continue to carry out checks and researches in public catering facilities as well as other service organizations and service providers on maintenance of normative fire and technical safety requirements. Today, inspections have been conducted in the “World of Gold” trade center that belongs to “Vagharsh and Sons Concern” LLC. As a result of inspection, the company will be handed over orders to eliminate registered irregularities in the established deadlines. After some time from transfer of orders, double check will be carried out, and if it turns out that the irregularities are not eliminated, then the business entity will be subjected to administrative penalties. 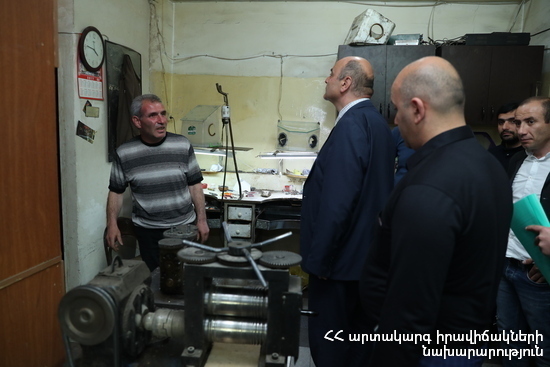 Simultaneously, inspections are being carried out in all regions of Armenia, where about 30 orders have already been issued to the business entities. The Ministry of Emergency Situations of the Republic of Armenia once again reminds and urges the business entities to fulfill fire and technical safety requirements in accordance with the RA laws “On Fire Safety" and “On State Regulation of Technical Safety Provision”.